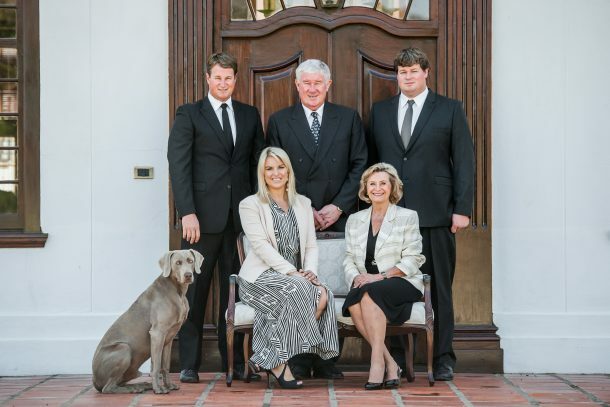 De Wetshof Estate is one of the few third-generation family wineries in South Africa. Situated in the Robertson Wine Valley some 160km east of Cape Town, De Wetshof is especially known as a pioneering estate of South African Chardonnay, a variety that proprietor Danie de Wet helped introduce into the country in the 1980’s. Since then De Wetshof has built a reputation as a leading New World Chardonnay wine estate, its wines having garnered local and international acclaim at various wine shows as well as exporting to over 25 countries around the world. The farm focuses on its five individual Chardonnay wines, but also produces Pinot Noir, Sauvignon Blanc, Merlot and Cabernet Sauvignon. De Wetshof has 200ha planted to vines and is owned and managed by Danie de Wet and his two sons Johann and Peter. Johann de Wet, CEO of De Wetshof, grew up among the vineyards that today produce the wine portfolio he oversees and markets. After obtaining a qualification in marketing, Johann worked at various wine farms in Europe and developed a keen interest in viticulture. When he started full-time work on De Wetshof in 2005, the farm’s 200ha of vineyards were part of his responsibilities, while brother Peter established himself in the cellar. Site-specific Chardonnay production and the unique terroir of the De Wetshof Estate lie at the core of Johann’s passions. Each of De Wetshof’s five Chardonnays are made from site-specific vineyards. These are planted on patches of terroir individually determining the unique flavour and aroma profiles of every wine. Features of De Wetshof’s terroir include exceptionally rich limestone soils, cold winters and summers cooled by the southerly breezes from the Indian Ocean some 90km away. The farm lies on latitude 33.8 °S. The Robertson Valley is a dry region, receiving some 350mm of rain per year. Lying on the edge or South Africa’s great Karoo, winters are sunny yet cold and frosty as the lack of could cover causes temperatures to plummet. These conditions create a solid period of dormancy for the vines during the autumn and winter seasons. Although summer days are warm in the 30°C vicinity, the afternoons are cooled by the breezes flowing in from the region of Cape Agulhas, the most southerly point of the African continent situated some 90km from De Wetshof. Harvesting at De Wetshof is done during the coolness of early morning – from 2am – to ensure cool, fresh grapes for the cellar teams to work with.